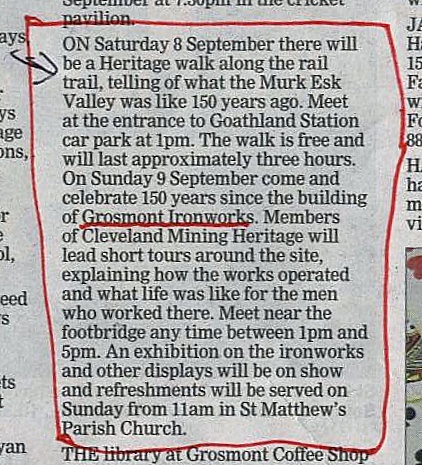 The Cleveland Mining Heritage Society are organising two walks as part of the 2012 Heritage Open Days. A three hour walk from Goathland Station on Saturday 8th September at 1pm. And short tours of the Grosmost Ironworks on Sunday 9th September between 1pm and 5pm. A look into the old Brickworks would be good. Private property and the current owner does not welcome visitors i’m afraid. Back in those days there was still more of the old Ironworks to see in among the trees etc as well.